CC BY 2.0-licensed Education by Richard Lee. 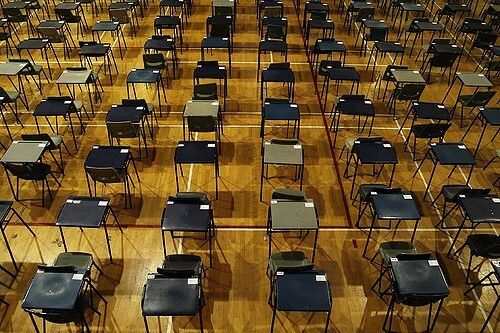 In New York City nine elite specialized high schools require students to take the Specialized High School Admissions Test as the sole criterion for admission. In 2012, a coalition of educational and civil rights groups filed a federal complaint with the United States Education Department saying that the single-test admittance policy disproportionately excluded black and Hispanic students. At the time, Mayor Bloomberg responded to the complaint by saying that the single-test method of admission was objective because the data used for admission was based on a test score. Despite the seeming objectivity of relying on a test score, glaring disparity is evident. Against the backdrop of a city in which 70% of public school students are Black and Latino, at the elite Stuyvesant High School, statistics reveal that Black and Latino students make up less than 4% of the total student body. At another elite school, Bronx Science, Black and Latino students account for only 7.5% of the student body. In response to this disparity and a continual decrease in the number of students of color sitting for the test and being admitted, legislators have proposed a $5 million package of initiatives aimed at preparing black and Hispanic students for the admissions test to increase diversity within the schools. Proposals to change the schools’ admissions requirements were made in 2014, but researchers found that the proposals’ methods of introducing more factors into the admissions process would not actually diversify the admissions pool. The current proposed initiatives would include hiring outreach coordinators at each high school who would recruit students from underrepresented middle schools to take the test, supporting a program that selects sixth-graders for a two year program that includes science enrichment and test preparation, and increasing the number of elementary and middle school gifted-and-talented programs in low-income neighborhoods. The Equity Project at Indiana University released a report arguing that there is a gap in data on LGBTQ students and more attention needs to be paid to disparities for LGBTQ students. Data analysis revealed that two Philadelphia charter schools suspend students with disabilities at a far higher rate than those without disabilities. Education Week is offering a webinar on leveraging analytics and assessment to close achievement gaps on April 4, 2016 from 2 to 3 PM EST. Advocates for parent and community engagement believe that ESSA provides an opportunity for parents and communities to make a larger impact on states’ academic goals, school improvement plans, and policies. The Schott Foundation released an infographic containing reform suggestions aimed at closing the gaps between students of high and low socioeconomic status. Alaska public schools face severe cuts as a result of oil money running out; one rural school is going to lose 5 of its 6 teachers. NYC teachers rallied at City Hall in February, urging Mayor Bill de Blasio to change disciplinary procedures that are unfair to black and Hispanic students, as evidenced by data revealing disparity in disciplinary rates between Black and Hispanic students and their white counterparts.